The BG20 has been specifically designed to modernise and improve the inspection routines of large calibre barrels. 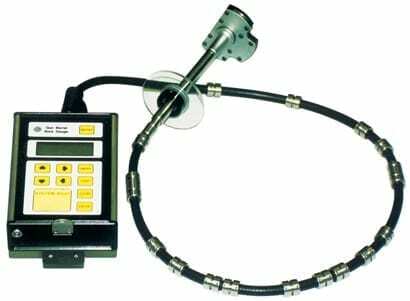 The BG20 is an electro-mechanical measuring device that has been specifically designed to modernise and improve the inspection routines of large calibre barrels. A two-point measuring head is supported in the barrel or chamber by a clear disk which facilitates the angular alignment of the head and the location of a suspected defect. The gauge may be introduced into the breech or muzzle end of the barrel and the measuring head located anywhere along its length. Any number of measurements may be taken and will be automatically stored under the barrel identification that is entered by the Operator. The measuring process can be effected in minutes. The operating software of the gauge provides the flexibility to automate existing in-service measurement routines or to accommodate specific defect investigations such as barrel bulging or ovaling. System BG20 is provided in a rugged carrying case affording protection, storage and ease of transportation.